Even though the Fantastic Beast movies are different from the Harry Potter films, there are similarities between the main characters. In Harry Potter, there’s the golden trio of Harry, Ron, and Hermione. In Fantastic Beasts, there’s the quartet of Newt, Queenie, Jacob, and Tina. Jacob is a loyal and funny sidekick similar to Ron, and Newt is a classic hero similar to Harry. Then there’s Tina Goldstein, who is the new Hermione for the next generation of Potterheads. 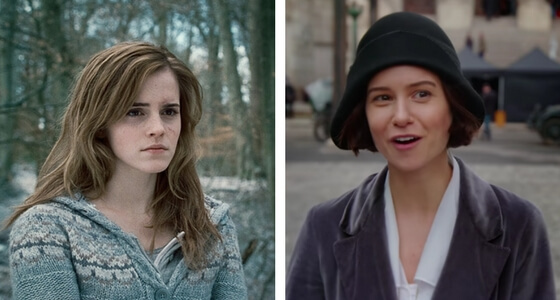 One of my first thoughts after watching Fantastic Beasts and Where to Find Them was that Tina is Hermione all grown-up. Potterheads never were able to see Hermione after she graduated from Hogwarts, and Tina gives us an idea of what Hermione would’ve been like as an adult. While the two characters aren’t exactly the same – Tina being an Auror and Hermione being more interested in books – they both have a lot in common. Both Tina and Hermione are hardworking, very logical, disciplined, and gifted with magic. Tina is introduced to Potterheads in a Hermione-like fashion; she’s telling off Newt for using magic the wrong way. Sound familiar? This is reminiscent of Hermione bossing around Harry and Ron on the Hogwarts Express. When it comes to character development, Tina evolves like Hermione does. Our first impression of Tina is her being overbearing and slightly obnoxious. After all, she’s interfering with our hero Newt’s plans! As the movies progress, so does Tina. Tina’s serious and bossy nature is overshadowed by her fierce loyalty and strong sense of right and wrong. She lets her temper get the best of her when all she wants to do is protect the people she loves. Instead of reigning in her temper, Tina can go too far when she protects the people she cares about. For example, when it came to protecting Credence from his adopted mother, Tina went so far as to attack Mary Lou to protect Credence. Hermione’s loyal and loving nature has often been forgotten due to her stubborn and headstrong personality. Whenever Hermione felt self-conscious, she’d start ordering everyone around and bragging about her magical abilities. Until she felt comfortable around her friends, Hermione ordered Harry and Ron around too much. Tina treated Newt like a criminal until she realized that Newt was trying to protect his creatures. Even though both Hermione and Tina are heroic characters, they have to fight against their insecurities. While Hermione was the cleverest witch of her age, Tina is the cleverest witch of her time. Due to her being demoted in the Magical Congress of the United States of America, Tina’s abilities haven’t been fully explored. Yet Potterheads know her to be a gifted dueler with both defensive and offensive spells, and Tina is a quick thinker along with being a powerful Auror. Tina has shown an interest in magical creatures too, since she helps Newt protect them. There is little magic that Tina is incapable of doing. While Hermione began the tradition of empowered witches, Tina has brought it to a whole new level. Hermione and Tina both doubt themselves, but where Hermione shrinks from people’s wrath, Tina fights back. She never allows anyone to dismiss her or make her feel lesser. Instead, Tina always has something to say. We see Tina doing so much during a time when women were allowed to do so little. Even though American wizards aren’t as liberal as British wizards, Tina is a modern woman. She openly challenged Percival Graves (who was actually Grindelwald) and Newt’s brother Theseus when he attacked them. Tina isn’t more or less capable than Hermione, but she’s more confident and mature enough to know when to fight back. Tina is the new Hermione for the generation of Potterheads who are now adults. Tina can inspire young Potterheads who are newly discovering the wizarding world, but to us older fans, she’s the next step up from Hermione. While I will always love Hermione, it’s now become more difficult to relate to an eleven-year-old. I love the Fantastic Beasts movies because I relate to Tina. She’s figured out what she wants, and she’s self-assured. Whenever I doubt myself, I remember that Tina has doubted herself too, but then she remembered to be confident. Madam President Seraphina Piquery, who was a difficult person to stand up to, dismissed Tina for all intents and purposes. Tina never let that get to her. Then when Tina saved the wizarding world with the help of Newt, Tina proved that she’s too important to be disregarded. Tina is the natural progression in having Hermione as a strong, independent female character. Tina is who comes next. Where Hermione broke the mold, now Tina is expanding what it means to be Hermione. Tina is the new Hermione for the modern generation. She duels even the most powerful of wizards, she saves the day, she stands up for herself, and she surpasses all expectations for what a heroine can be.